I am showing you my main workspace this week. These are my favorite FX pairs that seem to give constant results. One of the problems with FX is that there are so many pairs. So, I stay focused and just look at these on any time frame. 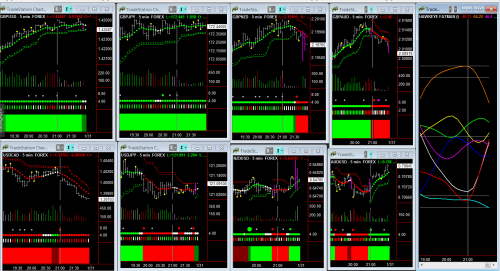 Look at the 15 minute Fatman on the right of the chart which shows the pairs with the lowest risk of trading. I look at the extremes. Look right at the end of the day to see the British pound (brown line) became overbought and the Aussie dollar (red line) started to rise from oversold, as was the CHF. I suggest you don’t trade the CHF as it has a large margin requirement. If you change this chart to 30 minutes the same powerful setups are there. Remember the Fatman changes to 90 minute. It still amazes me how the Fatman hits the trades on any time frame – right on the nail. My favorite pair is GBP/USD. Its movement is always regular. We find price movement almost every trading day. The two currencies are equally strong comparing with one another. Next PostNext Market Update. Not Too Late For Gold?